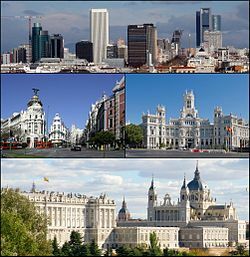 is the capital and largest city of Spain. The population of the city is roughly 3.3 million and the entire population of the Madrid metropolitan area is calculated to be around 6.5 million. It is the third-largest city in the European Union, after London and Berlin, and its metropolitan area is the third-largest in the European Union after London and Paris. The city spans a total of 604.3 km2 (233.3 sq mi). Madrid is considered one of the top European destinations concerning art museums. Best known is the Golden Triangle of Art, located along the Paseo del Prado and comprising three museums. The most famous one is the Prado Museum, known for such highlights as Diego Velázquez's Las Meninas and Francisco de Goya's La maja vestida and La maja desnuda. The other two museums are the Thyssen Bornemisza Museum, established from a mixed private collection, and the Reina Sofía Museum, where Pablo Picasso's Guernica hangs, returned to Spain from New York after more than two decades. The Prado Museum (Museo del Prado) is a museum and art gallery that features one of the world's finest collections of European art, from the 12th century to the early 19th century, based on the former Spanish Royal Collection. The collection currently comprises around 7,600 paintings, 1,000 sculptures, 4,800 prints and 8,200 drawings, in addition to a large number of works of art and historic documents. El Prado is one of the most visited museums in the world, and it is considered to be among the greatest museums of art. It has the best collection of artworks by Goya, Velázquez, El Greco, Rubens, Titian, Hieronymus Bosch, José de Ribera and Patinir; and works byRogier van der Weyden, Raphael Sanzio, Tintoretto, Veronese, Caravaggio, Van Dyck, Albrecht Dürer, Claude Lorrain,Murillo and Zurbarán, among others. Among the most famous paintings in this museum are 'Las Meninas,' ‘The immaculate Conception,’ and ‘The judgement of Paris. The Reina Sofía Museum, in full Reina Sofía National Art Museum (Museo Nacional Centro de Arte Reina Sofía, abbreviated as MNCARS), is the Spain's national museum of 20th-century art. The museum is mainly dedicated to Spanish art. Highlights of the museum include excellent collections of Spain's greatest 20th-century masters, Pablo Picasso, Salvador Dalí, Joan Miró, Juan Gris and Julio González. Certainly the most famous masterpiece in the museum is Picasso's painting Guernica. The Reina Sofía also hosts a free-access library specializing in art, with a collection of over 100,000 books, over 3,500 sound recordings and almost 1,000 videos. The Thyssen-Bornemisza Museum (Museo Thyssen-Bornemisza) is an art museum that fills the historical gaps in its counterparts' collections: in the Prado's case this includes Italian primitives and works from the English, Dutch and German schools, while in the case of the Reina Sofía the Thyssen-Bornemisza collection, once the second largest private collection in the world after the British Royal Collection, includesImpressionists, Expressionists, and European and American paintings from the second half of the 20th century, with over 1,600 paintings.